It's time for tryouts for the punctuation talent show, and little Alfie the Apostrophe doesn't think he can beat the "more exciting" marks with his simple magic show (making letters disappear). On the day of the auditions, the exclamation points cheer, the question marks tell jokes, and the periods and dashes do a Morse code routine, but in the end, it's Alfie that steals the show! 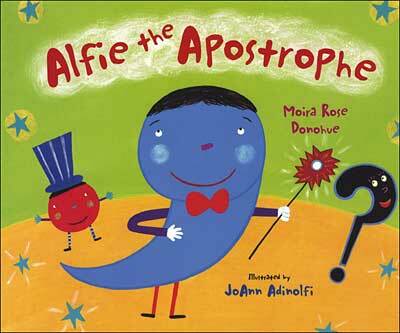 This book teaches about all the main punctuation marks, not just the apostrophe. Donohue's choices for punctuation mark character traits are quite clever and do make sense. They can help students better understand the roles each punctuation mark makes, but students may need a little help seeing the connections. (1) not read this book as an introduction to punctuation marks, but after kids have some familiarity with the marks covered. That way they will "get" the jokes and walk away with a deeper understanding of the role of each mark. Below are sample spreads from inside the book. It's a fairly wordy story, but not too much to prevent our recommendation. In the first spread, little Alfie is worried about his chances in the upcoming punctuation talent show. His parents try to reassure him that his contractions and possessives magic show is going to be a hit, but he is still worried. In the second sample spread, Alfie follows his father's advice and looks up the word contraction to read about its 'noble tradition'. He finds out that contraction "came from the Greek word meaning 'turning away.' As in 'turning away' letters to make contractions..."